The Innovation ACT competition ends this evening with the announcement of the winners. It seemed a good opportunity to think about how to use mobile technology to improve such start-up competitions. Points can be earned for sharing particular learnings or experiences to our InnovationACT Facebook group. Details will be given throughout the program." Workshop 5: Finishing Business Models Civic. 1. List 3 things you are passionate about or interested in. 2. List Some of Your Personal Strengths. EG. Skills, Experience, networks. 3. What are you looking for in potential team mates." 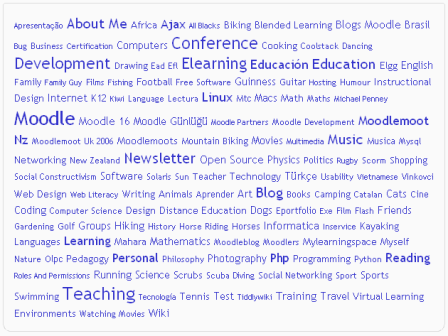 Select an interest from the Tag Cloud. Hold up your phone and use it to help find the people who share your interest. Something more sophisticated might be possible with Social Media systems, but Moodle has the advantage that the information is limited to the participants.